The Los Banos Police Department Code Enforcement Division is committed to the beautification of our neighborhoods and the entire community by providing responsive services to citizens. It is our mission to address concerns of unsafe, unhealthy, and unsightly conditions within our community. With this idea in mind, we will work to provide a clean, safe, and healthy environment and improve the overall quality of life in Los Banos. The Police Department Code Enforcement Division is comprised of a Police Sergeant, two Code Enforcement Officers, and an Administrative Clerk under the direction of Commander Ray Reyna. The Code Enforcement team has two main functions: community preservation and animal control services. 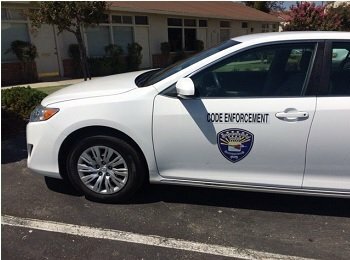 Contact information for our Code Enforcement team is available on the Police Department’s webpage under “Police Contacts.” To report hazards or issues requiring immediate intervention, please call police non-emergency dispatch at (209) 827-7070, extension 0 or dial 9-1-1 for emergencies. 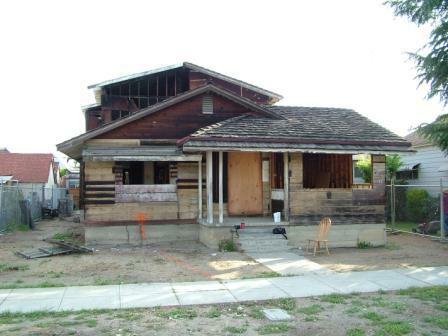 The Code Enforcement Division works in partnership with other City departments, allied agencies, and the community to enforce violations of the Los Banos Municipal and Zoning Ordinances. With these goals in mind, our Code Enforcement team will strive to keep the community a place our citizens are glad to call home. When does Code Enforcement get involved? Code Enforcement initiates action after receiving a complaint or observing a violation. In all cases, the property owner is notified of any existing violations. If a property owner does not take action to correct the violation, the property may be declared a public nuisance and will be subject to abatement by the city. Property owners will be held responsible for all costs incurred by the city to abate the violations on their property. You may report a problem by contacting Code Enforcement at (209) 827-7070 ext 141 or by clicking on the on-line complaint form link listed in the menu at left. Animals are regulated by the Police Department’s Code Enforcement Animal Control division. If you have animal control questions or need assistance, the city’s Animal Control Officer Jason Martin can be reached at (209) 827-7070 ext. 252. If you have an emergency please dial 911. We remind you that if you own, control, harbor or posses any dog over the age of four (4) months, it must be vaccinated for rabies, as required by state law. The rabies virus remains active in the wildlife populations in California, so the best way to protect animals and humans from this potentially fatal disease is to keep dogs currently vaccinated. Residents of Los Banos must have each dog over four (4) months old licensed. Dog owners may purchase a license for one, two or three years at a time. Those who purchase a two or three year license will enjoy a slight cost savings. Dog owners may also opt to keep the same dog tag and number. Licenses are available at the Police Department, 945 5th Street, Monday-Friday from 8 a.m. to 5 p.m., excluding city observed holidays. Seniors citizens are given a 50% off discount. Rabies vaccinations are required before a license can be issued. Vaccinations are valid for up to three years so dog owners can now bring in that proof of vaccination and purchase a license for the same time frame as the vaccination certificate. Are you looking to adopt a dog, cat, puppy or kitten? We have many animals in search of loving families. Come visit our animal shelter at the end of Airport Road (off of West I Street). You can call and make an appointment with an Animal Control Officer or visit the shelter on Saturday mornings, when the Volunteers for Animals are at the shelter. Are you looking to help our Volunteers for Animals? Applications can be obtained at the Police Department lobby between the hours of 8 am 5 pm, Monday-Friday. Once turned back in, a background check will be conducted and the process will begin. If you have further questions you can contact Animal Control Officer Jason Martin at 209-827-7070 x 252. The volunteers meet every 2nd Thursday of the month at 5:00 p.m. at the Los Banos Police Department Annex Building, located at 535 J Street. This confidential form allows you to submit a request for Code Enforcement investigation. The exact address of the violation is necessary. All fields are required. Incomplete submissions will be discarded. Have you reported this violation to another agency? The City of Los Banos Animal Control division deals with a wide range of calls for service related to animals within the City of Los Banos. Local ordinances are often used to enforce many violations, but State laws from the California Penal Code and California Food and Ag codes are also used to support our enforcement efforts. Below are several enforcement ordinances that the Animal Control unit commonly responds to. Every owner of a dog which is four (4) months of age or older, and which is kept in the City, shall obtain and maintain a current dog license tag for such dog from the City and shall pay the license fee as imposed by resolution of the City Council. No person shall refuse to exhibit such license when so directed by an Animal Control Officer, Public Safety or Code Enforcement Officer. The owner shall obtain the initial dog license tag within thirty (30) days of the dog reaching four (4) months of age; or within thirty (30) days of owning/keeping/possessing a dog over the age of four (4) months. No person owning or otherwise having an animal in his or her care, charge, control, custody or possession shall cause or permit such animal to be without proper care and attention under conditions that endanger the health or well-being of an animal or other circumstances that could reasonably be expected to cause suffering, disability, or death to the animal. Proper care and attention includes but is not limited to proper and adequate food, water, shelter, sanitary enclosures or surroundings, qualified medical care or attention and required vaccinations, for such animal at a level, which insures the animal’s safety, good health, and well-being. Any person abandoning their animal shall be subject to an administrative citation and fine as set by resolution of the City Council and or a misdemeanor. (a) No person owning or otherwise having an animal (excluding cats that have been spayed or neutered) in his or her care, charge, control, custody or possession shall cause, permit, or allow such animal to run, be or remain at large on any public street, road, alley, park or other public place in the City. “At-Large” shall mean the condition wherein an animal is off the premises of its owner and is not under secure restraint by a substantial leash, chain, halter, rope, or rein, at a length necessary to maintain and keep such animal under effective charge and control. The provisions of this Section shall not apply to a service or assistance dog; a dog participating in field or obedience trials; animal exhibitions; or a dog assisting a public safety officer engaged in law enforcement duties. (b) No person owning or otherwise having an animal (excluding cats that have been spayed or neutered) in his or her care, charge, control, custody or possession shall cause, permit, or allow such animal, even though not at-large, to be in or upon private property other than that of the owner, except with the consent of the person in charge of the private property. The provisions of this Section shall not apply to a service or assistance dog; or a dog assisting a public safety officer engaged in law enforcement duties. (c) Any animal found on any private property without the consent of the owner may be taken up by the owner or possessor of the property and delivered to the Animal Control Officer or detained on the property until surrendered to the Animal Control Officer. Every person taking up any animal under the provisions of this Section shall, within twenty-four (24) hours thereafter, give notice thereof to the Police Department; and shall surrender such animal to the Animal Control Officer without fee or charge. (a) It shall be unlawful for any person to keep on any premises, any dog, fowl, or other animal, that habitually barks, bays, cries, howls, or makes any other noise so continuously or incessantly as to unreasonably disturb the peace and quiet of the neighborhood or in such manner as to disturb or annoy persons in the neighborhood who are of ordinary sensibilities. (b) Upon written complaint of two (2) or more persons residing in different households within three hundred (300) feet of the location of the disturbance that a dog, fowl, or other animal habitually barks, bays, cries, howls, or makes any other noise so continuously or incessantly as to unreasonably disturb the peace and quiet of the neighborhood, the Animal Control Officer shall notify the owner/custodian of the dog, fowl, or other animal that a complaint has been received and the person shall take whatever reasonable steps the Animal Control Officer deems necessary to alleviate the noise. (c) The Animal Control Officer has the authority to issue an administrative citation to any responsible person for a violation of this Section. A responsible person to whom a civil citation is issued shall be liable for and shall pay the fine or fines as set forth by resolution of the City Council. (1) Attempt to make personal contact with the responsible person(s) in person, by telephone or by letter in an effort to correct the problem. (3) Grant a reasonable extension period to permit time to correct the problem not to exceed ten (10) days. No person shall stable, keep, pasture or maintain livestock within the limits of the City, unless expressly allowed to do so by the Zoning Code. No person owning any interest in any lot or parcel of real property within the limits of the City shall permit livestock to be owned, kept, possessed or maintained upon such lot or parcel of real property unless expressly permitted by the zoning Code. This Section shall not apply to any circus, carnival or show otherwise permitted to operate temporarily within the limits of the City. (a) No person shall have, keep, maintain, breed, sell, trade or let for hire, any wild, exotic, dangerous, or non-domestic animal without first applying to and receiving special authorization from the state of California, Department of Fish and Game and the City. The keeping or maintenance of such animals shall also conform to the City zoning code. (b) The Animal Control Officer may authorize the keeping or maintaining of any wild, exotic, dangerous, or non-domestic animal when, in his/her opinion, any such animal may be kept or maintained without endangering the safety or any person, other animal or property, nor create a nuisance; provided, however, that the Animal Control Officer may require any such animal to be properly caged, tethered, or restrained, and that he or she may create such additional requirements that may be necessary and proper under the circumstances. Any privately owned wild, exotic, dangerous, or non-domestic animal shall require a license fee as specified in the city fee schedule; the initial fee to be paid at the time of application. The Animal Control Officer may revoke such authorization when, in his or her opinion, the safety of any person, other animal or property is endangered or that a nuisance is created by the keeping of such animal. (c) The provisions of this chapter shall not apply to licensed circuses, carnivals, zoos or other collections of wild animals under jurisdiction of the city, state or federal government. In April of 2017, Title 6 Chapter 1 of the Los Banos Municipal Code was updated and adopted by the City Council. This update included several changes to our ordinance’s designed to protect and regulate animals within the city limits. You can apply for relief from the maximum number of animals permitted, for a feral cat caretaker permit, a rescue permit, or a breeders permit by completing a Code Enforcement Special Application. It is unlawful to provide food, water, or other sustenance to feral cats without registering with the animal control department as a caretaker of feral cats. Approved caretakers are required to clean excess food daily, regularly trap and spay/neuter feral cats over the age of eight (8) weeks, identify all altered cats by tipping their ears, and vaccinate all trapped cats for rabies and other required vaccinations/immunizations required by the State. Sec. 6.1.4007. Animal rescues within the city limits are required to obtain an annual permit, giving them the authority to hold a specific number of dogs and/or cats at a location for the purpose of placing them in permanent homes. Among other requirements, rescues are required to provide proof of current and valid nonprofit group status and submit to annual inspections by the animal control department. Sec. 6-1.7001. No person may breed a dog or cat within the city limits without first obtaining a breeder certificate from the animal control department. Breeder certificates may be issued once annually, per animal, giving the lawful holder permission to breed one (1) litter per year. Anyone advertising to the public the availability of any dog or cat for sale, or otherwise, must display the breeder certificate number in the advertisement. The breeder certificate holder must also provide the certificate number to any person who purchases, adopts, or receives any animal from the certificate holder. No dog or cat may be sold, adopted, bartered, or otherwise transferred until it has reached the age of eight (8) weeks and has received its first immunization against common diseases. Breeder permits may be obtained, after paying a $75.00 fee, from the Code Enforcement Animal Control Division. Sec. 6-1.7002. A dog may not be restrained for more than ten hours in a twenty-four (24) hour period and the tether or chain provided must be at least ten (10) feet in length. The tether or chain must have swivels at both ends, and be properly attached to a pulley or trolley mounted on a cable so as not to interfere or become entangled with the animal or objects on the property. The tethering system used shall not allow the dog to leave the property of their owner or weigh more than one-eighth of the dog’s body weight. Any chain or tether shall be attached to a properly-fitted flat collar or harness worn by the dog and the use of choke chains or pinch collars is prohibited. The chained or tethered dog must have constant access to necessary shelter and water. Sec. 6-1.4007. 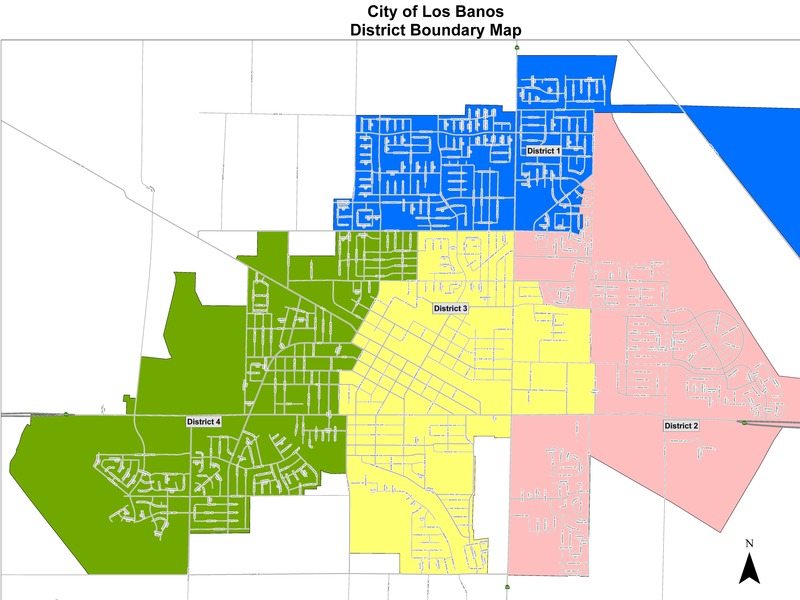 On September 9, 2015, the City of Los Banos was awarded a $322,500.00 Community Development Block Grant (CDBG), to fund code enforcement services within a specific census tract in Los Banos. The grant is set to expire on September 30, 2018. 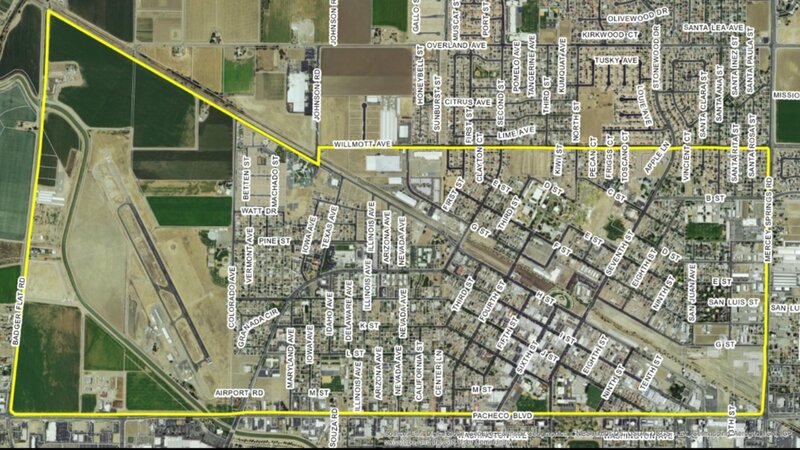 Through an RFP process, the City of Los Banos has selected CSG Consultants Inc., to provide code enforcement services within the tract designated by the grant. Two CSG code enforcement officers, Lee Holt and Lamonte Mack, will share the task of providing 40 hours of weekly service to the City of Los Banos. Lee and Lamonte bring years of valuable experience and resources with them. The photo below illustrates the approved census tract which the CDBG grant authorizes funding for these new code enforcement services.